By Michael Samuels, M.D. and Mary Rockwood Lane PhD., R.N. FAAN. 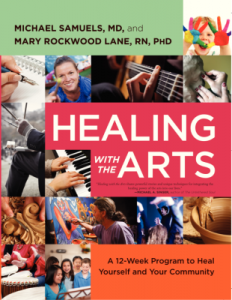 The goal of our 12 week program is for you to heal yourself, others, community and the earth with art. You will do that by finding your inner artist and joining with your inner healer to change your body’s physiology and optimize healing. By releasing tension and fear, by opening the mind to passionate creativity and the forces that made us, the inner artist and the inner healer release the immense power of love to heal. The inner artist and inner healer as one, is an exquisite balance of energetic wholeness. Art and healing is the oldest healing known and is now recognized as the most advanced by health futurists. Leland Kaiser, health futurist at University of Colorado, says that the future of healthcare is a convergence of art, spirituality, and healing. Art as a Healing Force gives each person the ability to heal with art. Each person is empowered to heal – themselves, others, community and the earth with visual arts, word, music, dance, ceremony and even huge events. This is wonderful! It’s time to make art and healing one on earth again as a individual and social force for healing and change. I’ve been buying your books since 1972. Just rereading Be Well, 1974, wondering what you were doing. Have nearly all your books, use them. All of them have changed my life, so thank you. Interested in this new course/ book. © 2019 Art and healing - edit by Michael Samuels - Contact him or the webmaster.